To participate in other IUF campaigns, please click here. This campaign is now closed. Update: Carlsberg continues to attack the rights of workers at its Cambodian joint-venture Cambrew. On July 21, a provincial court dismissed the company’s demand that Cambodian Food and Service Workers Federation (CFSWF) leader Sar Mora pay the company USD 60,000 in ‘compensation’ for a warehouse strike last August which the union neither organized nor endorsed. At the same time, the court ordered a local union leader to pay the company USD 3,000! 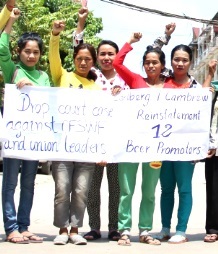 Global brewery giant Carlsberg is using the courts to bully and intimidate the IUF-affiliated Cambodian Food and Service Workers Federation (CFSWF), the union representing workers at its Cambodian joint venture Cambrew. The union has been seeking reinstatement of the beer promotion women who were dismissed last year for contesting the unilateral worsening of their terms of employment. Now Cambrew is demanding punitive financial 'compensation' from the union following a strike by warehouse workers which the CFSWF neither organized nor officially endorsed. Cambrew employs beer promotion women to market and serve Angkor beer at restaurants, where they compete with promoters from other breweries working in the same restaurants. A 'Beer Promoter's Code of Conduct' signed by Carlsberg and other brewers in 2006 was ostensibly to have led to improvements in their working conditions following international exposure of the hazardous, exploitative nature of the work. This did not prevent Cambrew from unilaterally replacing existing employment contracts in early 2016 which extended working hours (exposing the women to even greater risk) and abolished training and maternity leave. Workers have been put on short-term contracts to evade the legal obligation to offer permanent contracts after two years of service. Determined to defend their rights, the women went on strike, but when an arbitration tribunal ordered a return to work pending a resolution of the dispute, 12 of the women were terminated. On December 25, 2016 25 more beer promoters were effectively terminated when their contracts were not renewed. Thirteen of them were CFSWF members who had participated in the strike. In August 2016, workers at the Cambrew warehouse in Sihanoukville spontaneously struck in response to what was widely perceived as a discriminatory dismissal. Cambrew has now taken the union to court to demand 'compensation' for the strike. USE THE FORM BELOW TO SEND A MESSAGE TO CARLSBERG, calling on the company to drop the court case against the CFSWF, reinstate the beer promoters dismissed for defending their rights and enter into good faith negotiations to resolve long-standing issues.